From late morning ‘till night, The Battleaxes is at your service, whether for a spot of brunch and a coffee, a light lunch, 3 course dinner or just a pint of local beer. 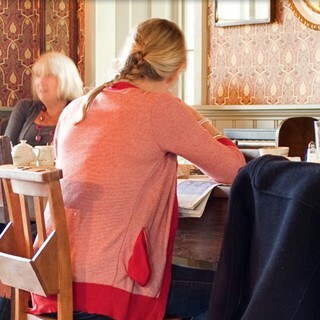 A beautiful country pub with a cosy dining area, pub lounge, and two huge and quirky function rooms. On the 1st floor, 6 luxury B&B guest rooms. With great, no fuss home cooked food and hand picked real ales, this is the perfect stop off point for all the family. I decided to book a table at The Battleaxes for Mother's day and unfortunately the service, food and overall experience was awful from start to finish. On entering the pub we were greeted and taken to our table, which was squeezed between two other tables of customers. We politely asked if we could be moved to another of the multiple empty tables as we felt a bit crowded in that particular seat. The waitress asked another member of staff, as she had shouted across the restaurant "whats the problem?!" to our waitress. She then said we could not move as all of the other tables were booked (a statement which later showed to be untrue as those tables remained empty for the remainder of our time in the pub). When ordering our food my mother stated that she had dietary requirements, and we asked about the portion of cauliflower cheese. The waitress told us that they were serving it in separate dishes so it wouldn't be a problem. Our starter arrived (smoked salmon, capers, gherkin, watercress and lemon) and I cannot explain how shockingly tiny the portions were, it was almost insulting! The salmon also wasn't "smoked" as described, it was flaked salmon. When our mains arrived, again, we were utterly shocked at what we received. I ordered the roast chicken, which was supposed to be served with stuffing. Which wasn't present, neither was the cauliflower cheese!? All of our potatoes were solid and quite frankly inedible. My mum's gravy was also cold, to which a different waiter suggested he could "re-plate" the food - we struggled to see how this was a suitable solution. There was a tiny amount of vegetables that we all received, which again, is shocking for the amount we were paying and the fact we were told we couldn't just order one course! Overall it was unfortunately a terrible experience, which was made worse by the fact I was still charged for the dessert for my sister, and my main meal. Unfortunately, we will not be visiting ever again and have of course told our family and friends about this experience. As I said to the manager, it was a real shame as we always prefer to support local businesses over chains, but this was a real disappointment, especially on such a special day. Fantastic food, will definitely be coming again. Food was excellent but the area we sat had 4 large parties going on and was very noisy. As we were a small group of 3 a quieter area would have been preferable. This was out 1st time to the pub which was recommended by a neighbour. Very impressed with the selection of ales and the food was amazing...great taste,  presentation and portion size. Will  book again ...next time for a sunday roast. Really lovely pub. Sunday lunch was delicious. The starters were great but unfortunately we were all disappointed with the main courses. Was cold in the restaurant and ti was quite empty so atmosphere not great. Staff were pleasant. Food was ok. It wouldn't be my first choice to eat out there again. Great staff and food. Had a lovely birthday party for 21 guests. Couldn’t fault it! Had my son's 1st birthday in the large restaurant room at the back of the building and it was a resounding success. The guests were all impressed with the venue and the food and would likely visit again for Sunday lunch. So overall we had a great party here, the space was great for the little ones to run around in and play with their toys and as the weather was lovely too the beer garden was also a nice place for guests to cool off in! We used to come regularly about 2/3 years ago & loved The Battleaxes but had an unusually bad experience which stopped us from returning. We thought we’d give it another go this weekend so booked for a Sunday roast. The restaurant was surprisingly quiet & lacked atmosphere as well as being a bit untidy & dirty with food/rubbish on the floor around tables. The food was ok & the staff were friendly but service just seemed really slow especially as it wasn’t very busy. I hate to say we won’t be rushing back. Enjoyed Sunday lunch here...overall great experience and good food. Only reason for less stars is that a lot of the menu wasn't available and we were messed around a bit... Ordering then waiter coming 15mins later to tell us mostly not available so had to order something else. Same with desert. Had to wait 45 mins for mains. But I was very unimpressed with that. I have marked lower than I would have as we visit regularly and eaten on numerous occasions. However the meal on the Valentine's set menu was a little disappointing. The starter didn't have everything that appeared on the menu and was done cheaply and not worth the £10. The main was also unsatisfactory withe the skin on the sea bass fillet not at all crispy and the fondant garlic potatoe was hard and undercooked with no taste of garlic. I feel bad leaving this review as every previous experience has always been good and we love the pub. Would recommend to others and I am aware they had 2 new chefs on a busy night. A pitty but a genuine review based on the nights food experience only. Still had a lovely evening with polite and friendly staff. We visited for Sunday lunch with 2 family's and 3 children. We were greeted and seated promptly and drinks order taken and delivered quickly. Unfortunately the soda drinks didn't taste quite right but these were swapped without issue when requested. The food was good but not exceptional which was disappointing for £15 for a roast. The cabbage and red cabbage was excellent and the beef cooked well but the potatoes were lukewarm, under cooked and not crispy and the meal came with only splash of gravy. Service was very friendly but disorganised and quite slow. We had significant difficulty getting someone's attention to request sauces which were not offered when the food was delivered and no one came to check whether everything was ok. Overall we enjoyed the meal and felt welcome at this venue and we may choose to visit again. However improvements to service is needed for an improved rating. Very friendly staff. Nice surroundings with good food. Recommend the Sunday roast! Room was adequate, best thing was the bathroom. As for the food suggest they get a new chef. Seasonal greens consisted of  only cabbage and a  couple of peas. Very small portions especially pork belly ,especially considering it was £15. Desserts very expensive. Menu said roast came with  cauliflower cheese per meal but we were given a small portion to share between 4 people. Staff pleasant but forgot dietary requirement order of soya milk and had to ask for milk again. Service fine but food and pricing very disappointing. A very small and limited roast for the price. The only things that would have improved Christmas Day lunch would have been to have a drink on arrival and coffee at the end of the meal as part of the package. Staff as always were fantastic, thank you for saving me the hassle of cooking and cleaning up! A great Christmas meal for the whole family, thank you for looking after us so well!